The longest running theatrical show in Chicago isn't Chicago or CATS! or anything you've likely heard of if you live outside the city. 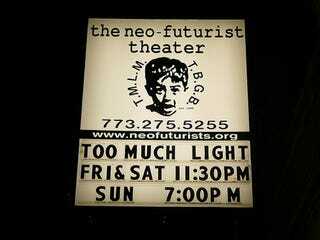 It's Too Much Light Makes The Baby Go Blind by a theater group called The Neo-Futurists. The show consists of 30 two-minute plays performed in a single hour as requested from a "menu" of previously conceived plays. One of the favorite bits is a striptease involving two minimally dressed young performers. But unlike most stripteases, the performers add more and more clothing until they're dressed appropriately for a night out in Siberia. This reminded us of the Toyota Motor Oil re-debut today, which NICKNICK found did not quite live up to expectations. You asked for: Two hot Asian models, a flat surface, lube, and a camera. You got: this. Leave it to Toyota to take the fun out of anything.